Podcast Ep. 70: Moncada signs, Ben Badler talks, PawSox sold! A group of New England business leaders, including Boston Red Sox President/CEO Larry Lucchino today announced its purchase of the Pawtucket Red Sox. The team had previously been owned by Madeleine Mondor, Michael Tamburro, and Ludwig Schwechheimer. Mondor is the widow of Ben Mondor, who purchased the Pawsox in 1977 and owned them until his death in 2010. In conjunction with the sale becoming official, there have been a series of reports that the team will be leaving the city of Pawtucket. City of Pawtucket Mayor Don Grebien told Rhode Island news station WPRO that he had been briefed by the new ownership group, that the new group is looking into a "destination" stadium, although he did later say the group told him it would "at least listen" if the city presented a proposal. A source told Alex Speier of The Boston Globe that the plan is to move the team to Providence. The Red Sox have had an affiliate in Pawtucket since 1970. The team has played in McCoy Stadium for that entire duration. The daily operations staff for the PawSox will be unchanged. Tamburro will continue to serve as CEO, while Schwechheimer continues his role as Vice President and General Manager. Matthew White will serve as Chief Operating Officer and Chief Financial Advisor. The Fort Report is back for another year! Every Monday during spring training, we will be detailing all the Red Sox minor league news and notes from the week that was down in Fort Myers. With all but one player already reporting to camp, baseball is officially back. After countless hours of work, SoxProspects.com unveiled new scouting reports last week for the top 20 prospects. 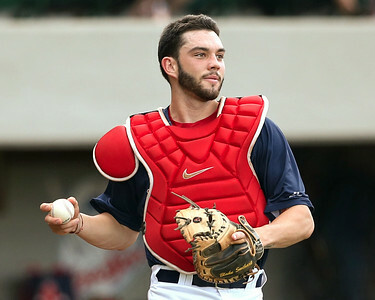 The reports can be accessed by clicking on any player on the home page, and Blake Swihart's (pictured) is linked here for your convenience. Ian Cundall and Chaz Fiorino did incredible work on these, and they are a great resource for fans to see the strengths and weaknesses of each prospect as we head into the 2015 season. Speaking of Swihart, he has been down in Fort Myers for over two weeks where he is getting a head start on learning the major league pitching staff. He told Peter Abraham of The Boston Globe that he wants to know each pitcher in case he is called up to Boston during the season. He also discussed his relationship with Jason Varitek, who has mentored Swihart on both catching and switch-hitting. The Red Sox have reached an agreement to sign 19-year-old Cuban infielder Yoan Moncada (pictured) to a record setting deal, as first reported by Jesse Sanchez of MLB.com. The club has not confirmed the signing but Joel Sherman of the New York Post is reporting that Sanchez will receive a signing bonus of $31.5 million, exceeding the then-record $8.27 million for a signing bonus for a minor league contract that the Diamondbacks paid Cuban right-hander Yoan Lopez last month. The Red Sox, who were already over their allotment for international free agent bonuses for the current signing period, will pay a 100 percent tax on the bonus. They had already incurred a penalty that will prevent them from signing international free agents to bonuses higher than $300,000 for two years. Moncada is 6 feet, 210 pounds, and possesses an impressive tool set, with his power, speed, and arm strength already grading out as plus according to Baseball America's Ben Badler. Moncada is a switch hitter, and while his swing is currently said to be better from the left side, Badler notes that his hit tool also has plus potential. He worked out all over the infield during his showcases but spent most of his time in Cuba at second base, and most scouts believe that he is best suited to second or third base in the long term. According to Badler, once the deal becomes official, Moncada will be ranked the 10th best prospect in baseball and the top guy in an already strong Red Sox system by Baseball America, topping catcher Blake Swihart who would move down to the 18th spot in their rankings. He is not considered major league ready, and is expected to need a year or two in the minors, especially after not playing in a game in more than a year. Badler believes his first assignment will likely be in Class-A. Today, we're pleased to announce the first stage in the rollout of a project we've had in the works for a long time: updated and expanded scouting reports for the SoxProspects Top 20! This offseason, our scouting staff, Ian Cundall and Chaz Fiorino, is undertaking a systematic review and update of every scouting report on the website. We hate to admit it, but the fact is that some of the scouting reports on the individual player pages got a bit stale over the past year or two as we went through some unexpected staffing changes and events in our personal lives. The primary goal that this project will achieve is to bring every report up to date with our most current information, primarily from first-hand looks when we've been able to get eyes on a player. The Red Sox announced that they will welcome eight more players as non-roster invitees to major league camp in spring training. The players invited include SoxProspects.com's second-ranked prospect, left-hander Henry Owens (pictured), and fellow lefty Brian Johnson, who is ranked sixth. It is Owens' second big league camp, while it will be Johnson's first. The other invitees will be shortstop Deven Marrero, Cuban right-hander Dalier Hinojosa, righty reliever Noe Ramirez, catcher Matt Spring, righty Keith Couch and infielder Jemile Weeks. It will be Marrero's third-straight invite to big league camp. It is the second time Hinojosa and Ramirez have been invited, while Spring and Couch will be attending for the first time. Weeks played 14 games for Boston in 2014 after being acquired from the Baltimore Orioles in a waiver trade for Kelly Johnson and Michael Almanzar. The Chicago Cubs have claimed former Red Sox lefty Drake Britton off waivers, the Red Sox announced today. Britton was designated for assignment last week to open a spot on the 40-man roster for Alexi Ogando. Britton was out of options, and needed to clear waivers before being assigned to the minor leagues. 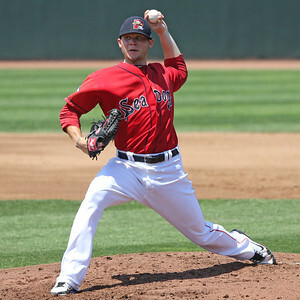 The left-hander was ranked as high as fourth in the Red Sox system by SoxProspects.com, that during the 2011 season, and was ranked as the 97th-best prospect in the game by Baseball America entering that year. With the winter leagues close to wound down and spring crept closer, the Red Sox organization was busy continuing preparations for the 2015 season. Rosters continued to take shape as the Red Sox signed the following players to contracts in the past few weeks. Bryan LaHair (pictured), who is best known for his 2012 season with the Chicago Cubs, when he hit .259/.334/.450 with 16 home runs and 40 RBI in 130 games as a first baseman and was selected to the National League All-Star team. LaHair spent last season in the Cleveland organization, splitting time between Double-A Akron and Triple-A Columbus. Felipe Paulino, a right-hander who has six seasons of major league experience as a starter and reliever with Houston, Colorado, Kansas City and the Chicago White Sox. Paulino made four starts for Chicago last season, going 0-2 with a 11.29 ERA.